Author: Trouern-Trend, Jonathan Set In . . . Early in 2004, Sergeant First Class Jonathan Trouern-Trend of the Connecticut National Guard began a year’s deployment in Iraq. 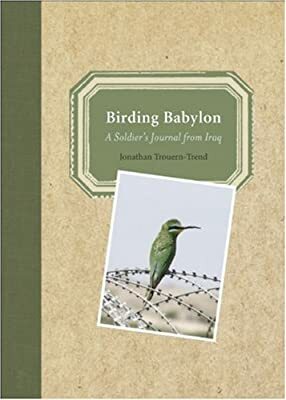 He had been a birder from the age of 12, so naturally he looked for birds during his free time on base and on trips ?outside the wire.” From nearly day one until he left Iraq, Trouern-Trend wrote about his sightings in an online journal that attracted thousands of readers. Now some of the highlights of his ?Birding Babylon” blog are collected in this small, beautiful volume, designed to resemble a birder’s journal. Cutting through the politics of war like birdsong, it reminds us of our imperishable connection with nature; of how birds and their journeys tie the world together; of the persistence of life even in a wasted land.